Welcome to language-easy.org! Well, as you have clicked on this article, I suppose that you are ready to learn everything you need to know about this basic element of German grammar: The German conjunctions. For sure, many of you might be familiar with conjunctions, as they also exist in English. However, German conjunction differ in form and usage. And, as a highly important part of German grammar, you should master it from the beginning to its end. In the following, I’d like to describe what the German conjunctions actually are and also which different types of German conjunctions there are. After that, we will have a look at subjunctions and conjunctional adverbs. Finally, we will have a look at a list which will give us an overview about the different topics of this article. By the way, in case you’d like to have some additional information about German conjunctions, just have a look at this article on Wikipedia. Hopefully, it will provide you with all the background information that you need. And now, let’s not lose too much time and come to the first part of this article and talk about what the German conjunctions actually are. Auf geht’s! Well, let’s have a look at the first topic of this article about the German conjunctions. So, as already mentioned, there are different types of conjunctions. In the following, I’d like to describe each one of them in some detail. So, this first type of German conjunctions connects two main clauses. Well, in a clause that is introduced by a conjunction, the sentence structure s exactly the same as in a normal main clause. Now, we come to the next type of German conjunctions. Well, this type is called “subjunctions”. So, that means that in a clause that is introduced by a subjunction, the finite verb is placed at the end of the sentence. And, of course, I’d like to give you some examples for this type of German conjunctions, the subjunctions. As already mentioned, please, try to keep them in mind: “bevor, da, dass, falls, weil, wenn, …”. By the way, dependent clauses that are introduced by a subjunctions are called conjunctional clauses. As a last type of German conjunctions, I’d like to list the conjunctional adverbs. Here, the following rule has to be applied: In a clause that is introduced by a conjunctional adverb, the finite verb comes before the subject. 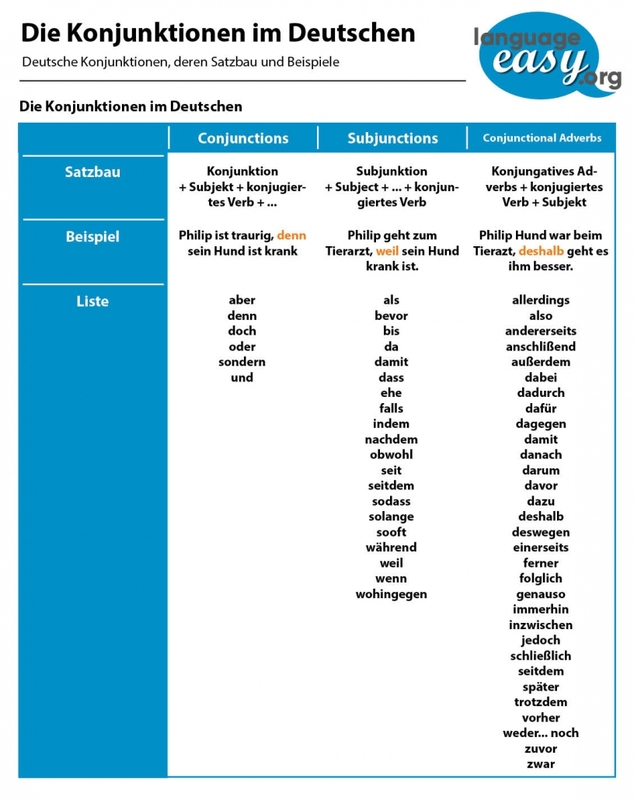 Now, let’s come to the final part of this article about German conjunctions and look at a short overview about the three types of conjunctions. So, let’s come to the final part of this article about German conjunction and have an overview about the three types. Well, as you already have learned, the type of conjunction has a huge influence on the word order of the main and subordinate clauses. Of course, it is really important to know, which conjunction is of which type – in order to use the correct word order. In the following, I’d like to present a table to you, that will provide you a conclusion of all the three types of German conjunctions.